Holidays 4U - Selection of holiday reviews of Holidays 4U. 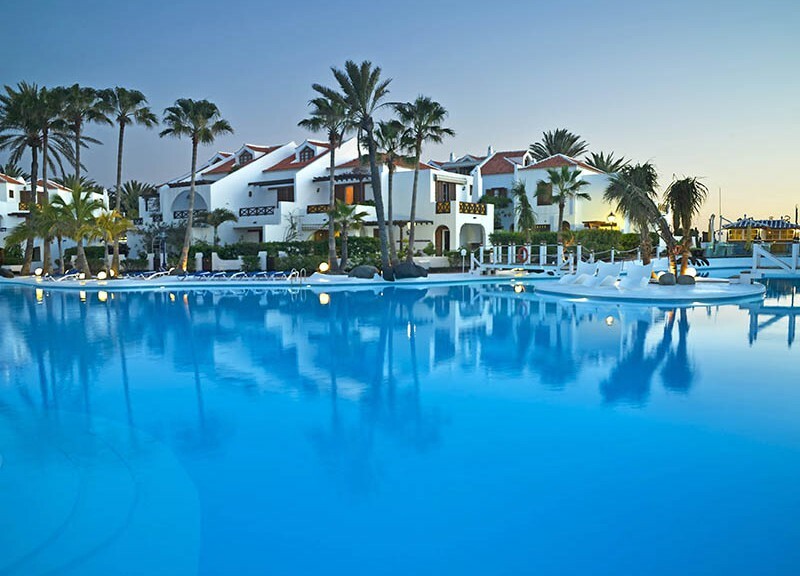 A selection of Holidays 4U reviews for holidays in the resorts of Playa de las Americas, Costa Adeje and Los Cristianos in Tenerife. Have stayed in the Santa Maria Aparthotel now for the last 3 years. This time we booked with Karen Durant from Holidays 4U. All went smoothly during the booking process and the apartment was very nice. Would recommend Holidays 4U. The apartment we stayed in had air conditioning. This is really needed in these apartments especially during the Summer months. The apartment we booked was on the 4th floor with lovely views. The complex is in a great location, being very close to the beach as well as to shops, restaurants and bars. There is a restaurant in the complex, but we chose to eat out every night as there is a good selection of different restaurants to choose from all close by. We stayed in a studio on Santa Maria in January 2016. It was very nice with a sea view to the right while sitting on the balcony and a pool view. The apartment gets a lot of sun on the balcony, but the owner provided a large sun umbrella which was a real help as it also shaded the apartment, which can get very hot. But the apartment has fixed air conditioning so it was OK. Not sure how we would have managed without it. The beds were comfortable, which is important to me with a bad back. We had a problem during our holiday as my handbag was swiped which had the apartment key inside, not to mention money and credit cards. But I phoned Holidays 4U and they called the local management for me, who came out to give me another key. Very good service. Thank you. 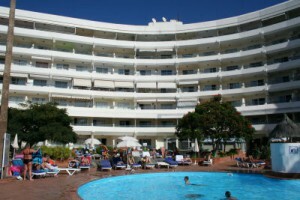 A selection of Holidays 4U reviews Parque Santiago 3 a complex in the Playa de las Americas resort in Tenerife. One of the best complexes in South Tenerife! A selection of Holidays 4U reviews on Parque Santiago 3 in the Playa de las Americas resort in Tenerife. One of the best complexes in South Tenerife! We booked our holiday through Karen Durant from Holidays 4U. We will definitely be returning to Parque Santiago 3 as we thoroughly enjoyed our holiday. 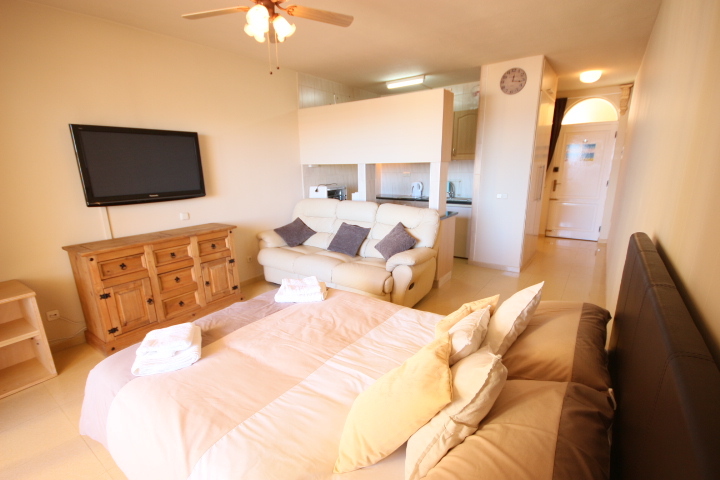 We chose a two bedroom apartment, which was very well furnished and equipped. The complex is very well looked after and maintained and our young children really enjoyed playing on the water slides. Thank you Karen for a fantastic holiday. We had a great holiday staying on this complex. This is definitely our preferred destination in Tenerife. We love it! It is advisable to book a privately owned apartments as the owners use the apartments themselves and give them that home from home touch. This apartment is typical of this as it is beautifully decorated and very well looked after. Definitely has that tlc touch that we look for in an apartment, which really helps to make you feel at home. We holiday every year in Tenerife and love this complex. It is so perfectly located, being right on the beach. All the amenities are an easy walk away including restaurants, bars and shops. The pool area is lovely with plenty of sun loungers which you can use free of charge. There are also lots of sun umbrellas, which was great as I burn easily. Although the apartment we booked was a self catering apartment, we ate out most nights as the surrounding restaurants are so reasonably priced. It is much nicer than booking a hotel where the food gets very samey. This way you can really sample a selection of different cuisines including Thai, Mexican, Chinese, Spanish etc. We recently booked a holiday in Tenerife for the second time using Karen Durant from Holidays 4U and like before have no complaints at all. 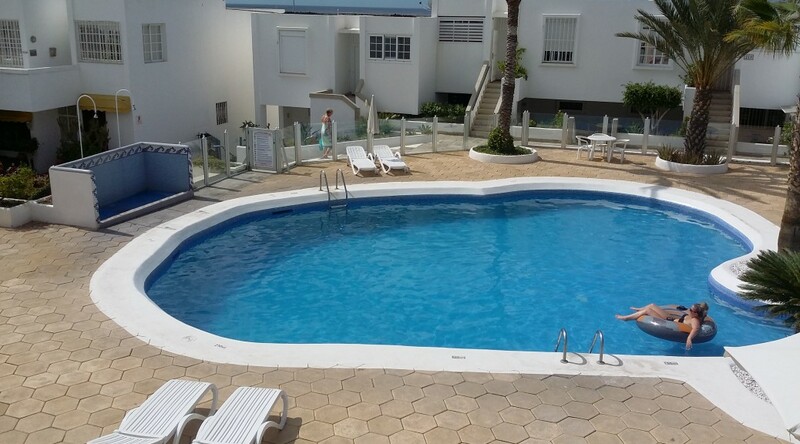 A beautifully refurbished studio on the Orlando complex in Tenerife with wonderful sea views. 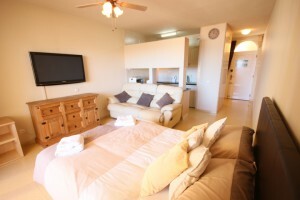 For more information on this apartment and many others, visit the Holidays 4U website. All of the apartments on Orlando are now privately owned and a lot of money has been spent on the common areas including the pools. It is never over-crowded so is a very relaxing complex, where you can really chill out and enjoy your holiday. There is also a pool bar where you can get some good value drinks and snacks. Infact most apartments on the complex are very reasonably priced, so a holiday on Orlando is very good value for money, all round. it is also in a great location as there are several beaches within a 5 minute walk, Playa Fanabe or Playa Torviscas for example. And the San Eugenio shopping centre is also a very short walk away. The other great thing about this complex, is that it is in a flat area, so really good for anyone with walking difficulties or for familes with very young children. There are also lifts on the complex, in case you have booked an apartment on a high floor: they often have very good sea views. There is also a bus station within a 10 minute walk, so if you want to explore the island, it is very easy to do so. The complex is quiet at night and really is a good bet for families, as there is 24-hour security and a lifeguard by the pool.